The month of April will be a bumper-booking period for holidays and short breaks as late-booking Brits scramble to make the most of the forthcoming Royal Bank Holiday bonanza, according to Escape Travel Money. The company, which offers travellers the opportunity to save pounds through using a pre-paid MasterCard when abroad (thereby avoiding hidden charges and fees), has noticed a 60% week-on-week increase in sales as the bank holiday bumper-period comes closer. Escape Travel Money believes the increase will continue to rise as more and more people scramble to grab a late deal and make the most of the forthcoming holiday period. As anyone who likes to keep a watchful eye on their finances will already know, the Escape Money Travel MasterCard saves British travellers’ hard earned cash from being eaten up by hidden fees, expensive exchange rates or charges for cash withdrawal when abroad. 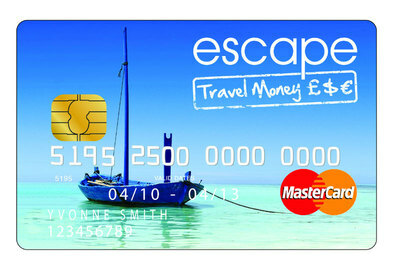 Customers with an Escape Travel Money card can upload cash onto their card before departure using the company’s better-than-high-street rate. Whilst abroad there are no fees for shopping with the card at any of the 30million MasterCard locations around the world, or for withdrawing money from ATMs.